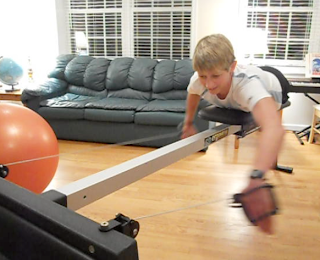 Today I received an early Christmas gift in the form of a Vasa Ergometer! I've been invited by Vasa to participate in a triathlon swim training development program using the "Erg". 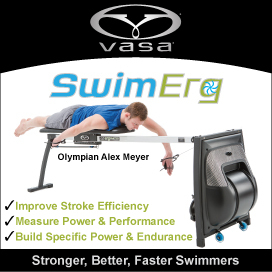 Vasa Ergometers and Trainers are embedded in the competitive swimming community, but somewhat less so in triathlon. That seems surprising considering what a time saver this is for time-crunched multisport athletes. 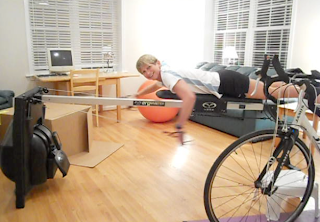 I created a little video of the assembly process and captured my first time on the Erg. The kids joined in on the fun too! One of the things I am most excited about is the monitor panel on the Erg that tracks time, distance, pace, stroke rate, and power. It will even measure stroke length and power for the left and right arms separately. This is going to take so much guesswork out of the swim and without walls and traffic to worry about, I can just focus on technique, power, and endurance. Assembly was super easy. Vasa provides everything you need including allen wrenches, wrenches, and a flat head screw driver. The whole thing only took 8 screws. I confess on having to "consult" with the equipment coach on which side of a lock nut needed to point out. I guess I missed that in my ten years and three degrees of engineering education. The packaging and instructions were high quality (made in Vermont!). It took a minute to figure out how to get on and off with any semblance of grace, but very quickly I was off and.....swimming! The kids tried it and enjoyed it too. It felt pretty natural! I had the resistance level set pretty low but even so it was quite taxing. That just tells me there is plenty of room to improve. The Erg joins the bike trainer and we may dust off the treadmill and make this a whole family triathlon workout room. Many thanks to Vasa and Fortyninegroup! And family, I am still excited about and hoping to get the new spatulas on my Christmas list.